The Neo d+ MYR Class B 3.5mm to Stereo RCA, 1.5m is a premium-quality RCA cable designed for professional audio applications. The Neo D+ Stereo RCA Cable has become the worldwide standard for DJs and music producers. It provides high-end audio fidelity and optimal reliability. The newly-designed 3.5mm stereo angled plug provides added stability, keeping your cable in place whilst in use. The rugged design includes highly-rigid cable separation with a concentric twisted structure for added durability. Neo Oyaide have been a staple in the audio cable world for years now. They have built their reputation on premium-grade design and high-end audio fidelity. This specialised table is designed for a range of uses. From general use with smartphones and tablets, as well as for use with DJ mixers, audio interfaces and other external gear. The Class-B series features thick 18AWG high-purity oxygen-free copper for conductors. This provides optimal signal integrity resulting in pristine sound quality. 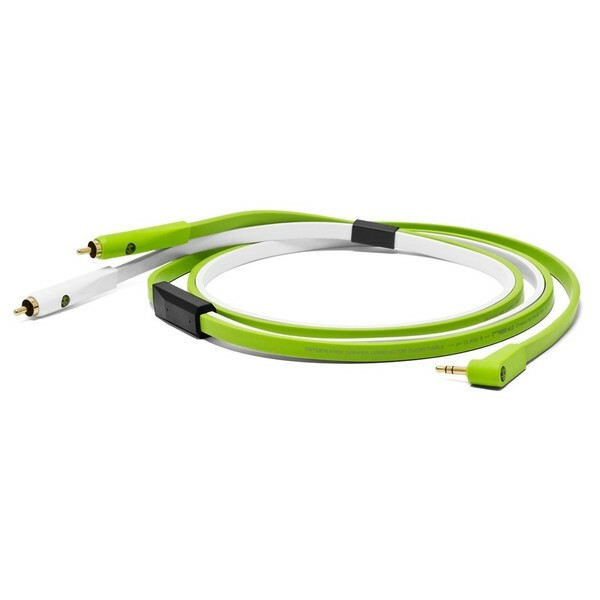 The flat design also helps to avoid interference between cables, with the green and white colours helping to differentiate between left and right channels.